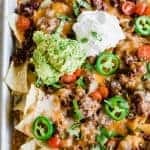 Sheet Pan Nachos. Tortilla chips loaded up with juicy taco meat, refried beans, melty cheese and all your favorite toppings! This easy family dinner comes together in 30 minutes and is large enough to feed a crowd! Easy to customize to make your own. Heat medium sized skillet over medium heat. Cook the ground beef breaking it up while it cooks. Once browned, drain the grease. Add in the taco seasoning. Pour in the tomato sauce. Stir to combine. Add the tortilla chips to a large baking sheet. Spread into an even layer. Spoon on the refried beans. Spread the taco meat on top. Sprinkle with shredded cheese. If using fresh jalapeno add it now so it roasts. Canned or jarred jalapenos can be added after baking. Bake for about 12-15 minutes until the cheese is fully melted. Remove from oven and top with desired toppings.